Would you like to live like a local when you are visiting a new city? Urban Residences combines the best of two worlds. The comfort, convenience and personal service of the best hotels in the world and the space and the pleasant, relaxed feeling of your own home. At Urban Residences, you can enjoy the freedom of your own studio, apartment, loft or penthouse and explore the city at your own pace. Urban Residences offers great locations you can unwind and relax or get work done in a surrounding of modern and minimalistic design. The studios and apartments are equipped with a luxury kitchen, bathroom and living room and fully equipped. Including Loewe TVs, Flos lighting, Miele appliances and Nespresso. Of course, there is also hi-speed wireless internet access. Together with our personalised service our guarantees for an amazing stay. Feel free to dive into the kitchen and enjoy a home cooked meal or discover one of the many nearby restaurants. 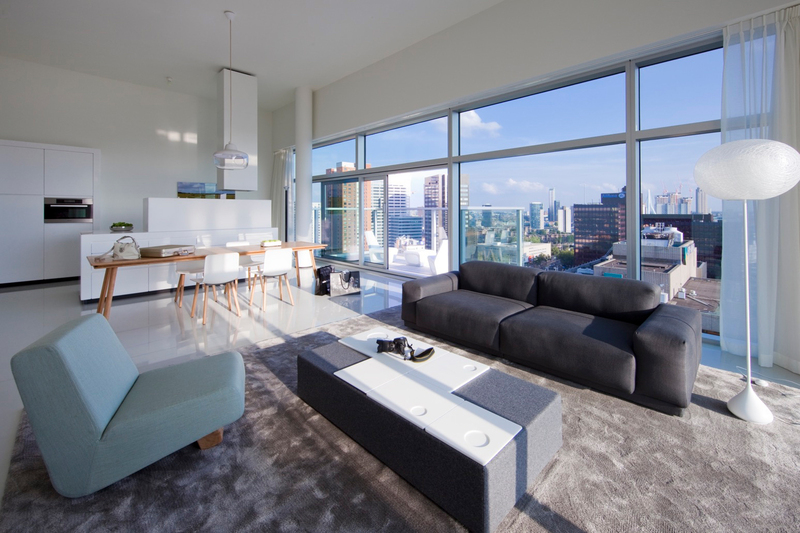 Relax on the sofa after a day’s work or shopping and enjoy the space and view over the city. That’s how many guests take it easy at the end of the day. But of course, you can go out for the evening. Our team is always on standby for tips on good food and things to do and see in the city. Penthouse, apartment, maisonette, apartment: choose what suits you best. Urban Residences offers several layouts and sizes. At the locations, you will find all the options with detailed descriptions. Planning a romantic weekend for two? Or looking for a holiday destination to explore a city and surroundings? Look no further. Check out all Urban Residences has to offer. We have been highly appreciated by expats and business travellers from around the world for several years now. Some stay for the duration of a week, but more often they stay for several months or even a year. The beautiful locations, quality apartments and great service are most mentioned as reasons to choose Urban Residences as their temporary residence. The Urban Residences project allowed the architect Wiel Arets to bring all these different design disciplines together in one overall concept. From the glass facade that offers beautiful city views, to the epoxy floor, the fully-equipped kitchen and designer bathroom. Arets designed all these different elements in such a way that together they become a harmonious living concept.